Fans of magnificently preserved ancient monuments will be in their element in Greece, with Meteora, Acropolis and the ancient theatre at Epidauru among the wonders to see. Greece is visited by roughly two millions British nationals per year, with a combination of the country’s history and magnificent weather huge incentives for tourists. It is most accessible to travel to Greece from a United Kingdom airport, although a combined trip using a car and ferry services is also possible. 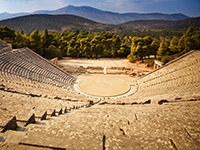 A flight from Birmingham to Athens, the capital of Greece, can take between six and eight hours on average, with journey times to other Greek cities not too dissimilar. Avoiding air travel is slightly more complex, but can be achieved by driving to Italy from the UK - a 23-hour trip in which a ferry can then be taken from Venice to Greece. At least two days should be reserved for this trip. Greece is two hours ahead of British Summer Time and three hours ahead of Greenwich Mean Time. Your diabetes management should not be majorly affected, but if you are uncertain regarding your medication, you should see a member of your diabetes team. The average climate in Greece is comparatively much warmer than the UK, with average high temperatures in Thessaloniki summers regularly around 28°C. The currency in Greece is the Euro. Much better rates are available by using ATMs, with a lesser transaction fee charged compared to some credit card fees which can charge a 2-3 per cent transaction fee or more for foreign purchases. There are no mandatory vaccinations required to enter Greece, however rabies is present in bats in Greece, so it is advised for those planning activities in remote areas that put them at risk for bat bites to receive a rabies vaccine. Greece is amongst the European countries that allow you to receive state healthcare either at a reduced cost or sometimes for free. It will cover you for medical treatment until you return to the UK. Medication is available in Greece, but payment is required from a pharmacy, for which the Greek translation is“φαρμακείο”, pronounced as “Farmakeío”. However, possessing an EHIC card allows you to receive treatment at a lesser cost and this money can be recouped when you get back into the UK. Blood and urine testing kits are available from many pharmacies in Greece. Greece has nearly five times as many pharmacists as in the UK, however, many pharmacies shut early in the afternoon and are not open in the weekend. If you are in need of medication, it is best to travel on a weekday morning. The emergency services telephone numbers to be called in Greece is 112. It is advisable to contact the manufacturing company of your medication prior to leaving the UK to find out what is available in Greece if your medication gets lost, stolen or damaged. It is also worth checking to see what different names your medication may be listed as. You should note which syringes are available in Greece, with U-100 syringes the most commonly used. How is blood glucose measured in Greece? Unfortunately, we do not have the information of whether blood glucose is measured in mg/dl or mmol/l in Greece. What language is spoken in Greece? Greek. Locals in a customer service environment will have a basic grasp of English but it would be wise to research some useful phases outside of purchasing goods.